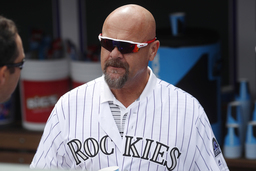 DENVER (AP) Larry Walker joined the conference call with reporters and quickly announced his arrival. "54.6 percent here," the longtime player with the Montreal Expos, Colorado Rockies and St. Louis Cardinals cracked. That's his percentage in this year's Hall of Fame vote. Keep up this sort of jump, though, and he may be able to proclaim something different next season in his 10th and final year on the ballot: Hall of Famer. Walker's vote total rose 20.5 percent from a year ago, but the seven-time Gold Glove outfielder still fell short of the necessary 75 percent threshold. The 2019 Hall of Fame class elected Tuesday included reliever Mariano Rivera, designated hitter Edgar Martinez and pitchers Roy Halladay - a Denver native who died in November 2017 when an airplane he was flying crashed - and Mike Mussina. The 52-year-old Walker took it all in stride. "I don't get set up for heartbreak or heartache if something doesn't happen," Walker said. "I'm a pretty level-headed guy." Still, Walker acknowledged being emotionally invested in the days before the vote was officially revealed. He saw on Twitter that at one point he was trending at nearly 66 percent on some of the ballots made public. In the end, he was on 232 of the 425 ballots cast. "I don't want to get too involved with that again next year, because your heart rate's going up and down," Walker said. "Part of me almost doesn't want to make it, because doing that speech in Cooperstown, probably would have a heart attack before I got up there to do it." Growing up in Canada, Walker was more interested in being an NHL goaltender than a baseball player. He didn't really learn the nuances of the game until he started out in the minor leagues. A quick study, he hit .313 with 383 homers and 1,311 RBIs in 17 seasons. He won three batting titles and an NL MVP award. "It was never in my mind as a kid growing up: It was playing in Stanley Cup Finals, not talking about the Hall of Fame ballot," Walker said. "Baseball was never on my radar, until I was offered $1,500 U.S. ... I couldn't wait to sign that contract to get that 2-grand Canadian, and off I went." Walker thinks his surge is due in part to analytics, even if he really doesn't understand such stats as dWAR (defensive wins above replacement). "I remember telling somebody a couple weeks ago, dWAR, I don't even know if that refers to a pitcher or hitter," Walker said. "I'm kind of clueless on all those things." One thing he's hoping eventually changes: having Coors Field held against him. Walker was a lifetime .381 batter with 154 homers inside the hitter-friendly park. "I took advantage of Coors Field as good as I possibly could and I'm glad I did it," Walker said. "I'm not sad about it one bit." Another Coors Field case study: Rockies first baseman Todd Helton, who received 16.5 percent in his first year on the ballot. Helton played 17 seasons with the Rockies and finished with a .316 lifetime average. "Todd was an amazing player," Walker said. "Unfortunately, if I'm falling into the Coors Field bias, then Todd falls into it more, because he spent his whole career there." Should Walker fail to get in next year, there's always the Today's Game Era committee, which voted in reliever Lee Smith and outfielder/DH Harold Baines. "I have some things that are Hall of Fame worthy, and I have some things that aren't," Walker said. "I've heard them all. I've seen them all. I've read them all. I'm good with both sides of the fence of it."